So after nearly two weeks of cookies, muffins, and cheesecakes…I have regained my senses (a reaction to the fright of the looming swimsuit season…) and returned to the perimeter of the grocery . I hope the baking isle doesn’t feel neglected, I’ll be back soon! Spring/soon to be summer has finally arrived! Wahoo! This is the first full week in Ohio where the weather is to stay above 50°F, holy moley! It is amazing how different everyone acts when the temperature goes up and the days get longer. How does the change in weather alter your daily life? Car windows are rolled down, house windows are opened up. Grilling. Baseball. Neighbors come out of hibernation. Sounds of children playing are heard well into the evening, this is mixed with the constant hum of lawn mowers. Grilling. The anticipation/excitement of school ending – I haven’t been in school for 4 years and I don’t have children in school, but I can still feel that air of excitement that can only be explained by the end of another school year. Flip flops. Grilling. Farmer’s markets. Grilling. Grilling. Grilling. Um…Have I mentioned grilling? Since I am apparently in love with grilling, would it be surprising that I have never grilled? Never, not even once. Other people have grilled on my grill, but I have not. Well that all changed this afternoon and I didn’t lose my eyebrows in the process. I was worried. So, Monday morning I made my normal trip to the grocery store and hit up the meat counter, not really knowing what to buy – good thing moms are just a phone call away! I ended up buying 2 strip steaks (every other steak looked like it could feed 3 of me….) and began praying that I wouldn’t ruin them! I did a bit of research on grilling times and such, but besides that I just went at it. I prefer my steak medium to medium -rare ( I assumed this since I enjoy sushi and figure the textures would be similar), so I grilled the steaks for about 3 to 4 minutes over medium-high heat. 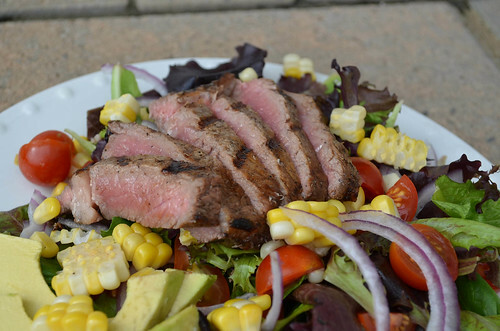 If you are unsure of grilling times, use a meat thermometer to guide you. I placed the steak on top a bed of greens and dressed the whole mess with a homemade blue cheese dressing. If I may say so myself, I did a decent (if not good) job. To prepare marinade: In a small bowl or large measuring cup (at least 2 cups in volume), whisk together all ingredients for marinade. Place steaks in large plastic bag and pour in about 1/2 cup of marinade per steak. Place in refrigerator for at least 4 hours. To Roast corn: I roasted in the oven (first time griller here…lets not go overboard just yet). 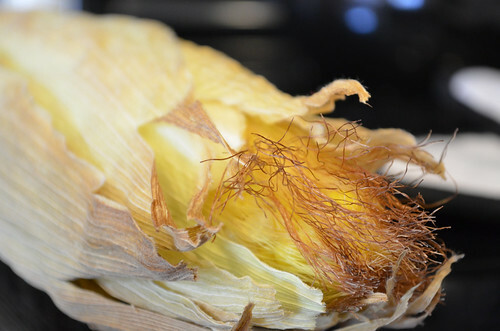 Remove a few of the outer husks (dryer ones), preheat oven to 350°F and place corn right on oven rack. Roast for 30 minutes. Remove from oven and cut kernels off the cob, set aside. 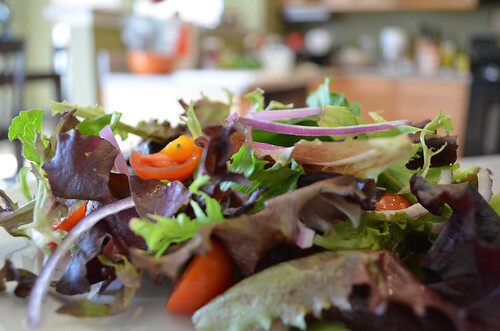 To prepare the salad dressing: Whisk together all ingredients for dressing, except blue cheese, in a small bowl or large measuring cup. Add extra milk if a thinner consistency is desired. Fold in blue cheese. Store in refrigerator. 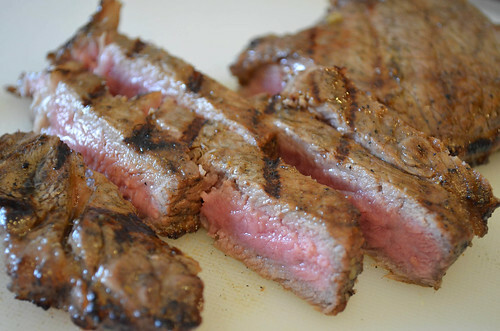 To grill steak: Remove steak from marinade. 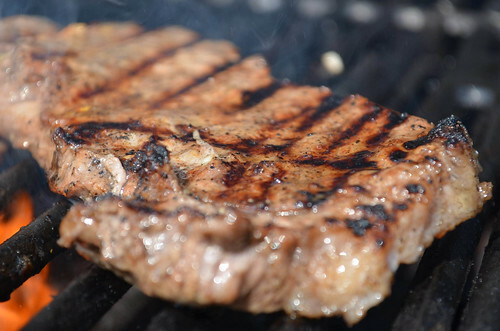 Place steak on a pre-heated grill over medium-high heat. Grill on each side until desired doneness is reached. For medium, about 4 minutes per side. Once done, remove from grill and let rest for about 5 minutes before slicing. Construct salad. 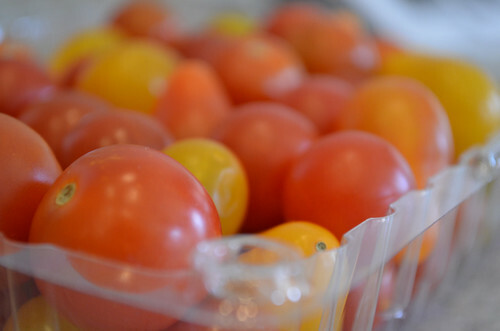 Toss together mixed greens, tomatoes, sliced onion, and corn. 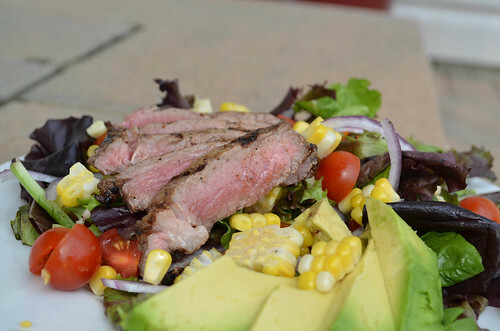 Garnish with sliced avocados and top with slices of grilled steak.